Late evening arrival in Tashkent .Transfer to the hotel. Check in. We begin in this capital city, where you are first introduced to the charming culture of Uzbekistan. The city sightseeing in Tashkent will include a visit to Hast Imam architectural complex, the Museum of Applied Arts and the State Art Museum to see embroideries and other fine crafts, visit Abdul Khasim Medrassah with its hujra cells used as metalwork craft workshops to produce jewelry and other goods. After breakfast depart by road on to the legendary Samarkand, the grand capital of the emperor Tamerlane. The road goes through Tashkent, Syrdarya regions and mountainous countryside of Jizzakh region of Uzbekistan where you may want to make spontaneous stop for photographing. After arriving and checking in the hotel, you will have lunch at a nice local restaurant. After lunch drive to the sightseeing tour in Registan Square with its majestic madrasahs and numerous shops. This morning, visit the great central square of Samarkand, the Registan. 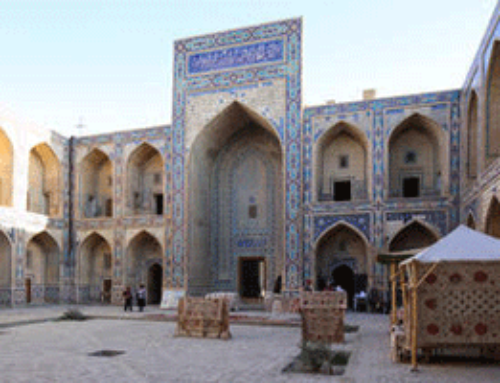 Continue to Gur-Emir, where Tamerlane is buried, to Bibi-Khanum Mosque and also visit the nearby market called Siyob. This market is famous from the ancient times and it occupies the same location like in old times. After lunch visit Shakhi -Zinda ensemble of the Mausoleums. This unusual necropolis has monuments of the 14th and 15th centuries, reflecting the development of the monumental art and architecture of the Timurid dynasty. After breakfast at the hotel you will start the tour by visiting Ulugh Bek observatory which is considered to have been one of the finest observatories in Islamic world. You will continue with the Mausoleum of St.Daniel being one of the most famous places of worship in Samarkand. After lunch drive to the actual site of the ancient city of Afrosiab, and after visiting the excavation with the archeologist and director of the museum, visit the Afrosiab Museum with its excellent collection of treasures from the site. After breakfast we’ll drive on to Nurata, once known as Nur, this ancient town held a strategic position on the frontier between the cultivated lands and desert. Nurata has retained some of the holy sites that attracted pilgrims from all over Central Asia. The ruins of a hilltop citadel in the town center near the bazaar mark Nurata’s history and said to have stood before the arrival of Alexander the Great. Below is the chief pilgrimage site, the Chashma spring, miraculously formed when Hazrat Ali-Mohammed’s son in law struck the ground with his staff. Hundreds of holy (unfishable) fish swim in mineral packed water. The mosque for visiting pilgrims dates back to the 10th century and subsequent reconstructions have preserved the roof of 25 cupolas. An adjacent museum details local history and culture through tools, clothes and ceramics. We’ll spend the evening with a local family, immersing ourselves in the culture and lifestyle. After breakfast we’ll venture into the desert for a day of camel riding, a centuries-old mode of Central Asian transport. We will meet semi-nomadic people living in the desert and learn about their contemporary lifestyle. We’ll spend a magical night in an authentic yurt camp, relaxing around a campfire under a crystal-clear dome of stars. After breakfast and some more camel riding depart Yangiqazgan to visit Aydarkul lake (about 250 km long) and continue on to holy Bukhara making a stop in Gijduvan to visit the most important ceramic center of Bukhara region. If we’re lucky we’ll have the opportunity to see centuries old tradition of using a donkey for spinning the millstones during the process of natural dyes grinding. Lunch at the local potter’s home. Continue afternoon drive on to Bukhara and visit Suzani artist in her home on our way to see how suzanis are made by hand. Arrive in Bukhara early in the evening. Dinner at the hotel or at a local restaurant. In the evening we will enjoy Uzbek traditional dinner at a local restaurant. After breakfast we’ll continue our drive west through Kizil Kum desert (Red Sands) to Karakalpakstan where you’re invited to discover a new adventurous experience through traveling along the archaeological monuments of fireworshipers and to the first capitals of Khoresmshah’s dynasty, such as Toprak-kala, Ayaz-kala, Koikirilgan-kala, Kizil-kala and many other monuments, some well over two thousand years old. 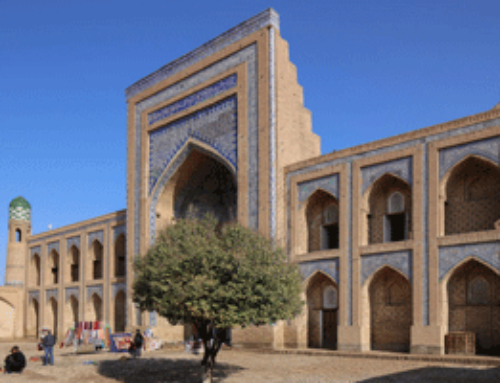 All these historical monuments are located in Amu-Darya delta, which has been densely inhabited for ages and was an important oasis long before Urgench or even Khiva were important. All these great settlements were abandoned many centuries ago and now hide within them the splendors of once great civilization. We will stay in traditional yurts just at the foot of Ayaz-kala with Ayaz-kul lake nearby and try traditional Uzbek and Kazakh food along with traditional Asian hospitality. After breakfast we’ll visit Toprak-Kala and Kizil-Kala on our way to Khiva, the last great oasis on the old caravan route. 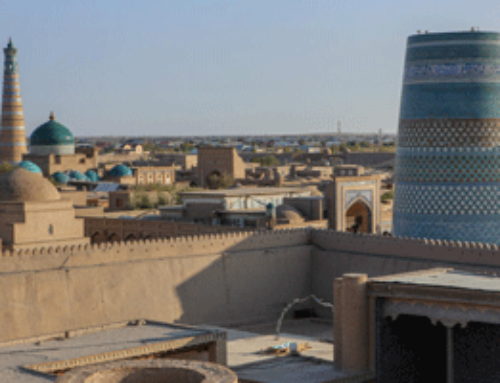 The rest of the day we’ll do some walking sightseeing of old Khiva. After breakfast we’ll continue sightseeing of Khiva, the most intact and remote city of Central Asia. Experience the richness of this museum city that houses the most homogenous collection of architecture in the Islamic world. In the evening dinner with folk music and dance. After breakfast drive to Urgench (capital of Khoresm region) to depart for Tashkent by air. 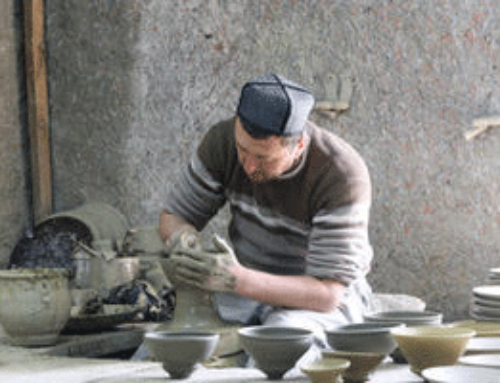 Upon arrival in Tashkent we’ll visit the private studio with museum & workshop of Akbar Rakhimov, a local potter and one of the finest ceramic artists in the country. To conclude the journey we’ll have a final feast of Uzbek national dishes and farewell toasts.